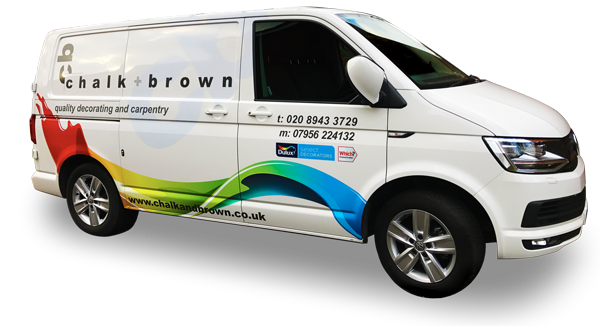 Painting, decorating and carpentry specialists in the South West London area since 1988. We have been successfully working together as Chalk & Brown in the SW London area since 1988 and have built up a loyal customer base. We understand that, when it comes to your home, you want the very best. You want the highest standards of workmanship, backed by superior levels of customer care and service. And of course you want a finished job that looks superb and makes your home an even brighter and better place to live. As members of Dulux select Decorators, we can offer a two year guarantee on all our decoration work, underwritten by Deluxe. We also have a high level of public liability insurance for your peace of mind. We use up to date equipment from the Festool Cleantec range to ensure your home is as dust-free as possible and to minimise disruption. Our work is always carried out by ourselves and we never sub-contract. Consequently, the majority of our work is repeat business and recommendations from existing customers. Please take the time to look through our reviews (here, on the Dulux Select Decorators site and also on Which Trust a trader to see what our customer say about us. We are delighted to take all enquiries and offer free, no-obligation advise wherever possible.